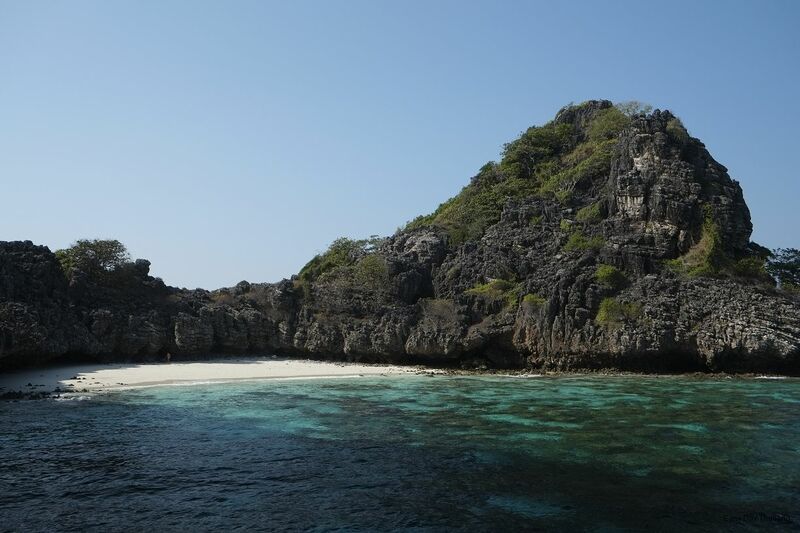 Koh Haa Islands Group – The Thai name for this site is from the name of the island group Koh Haa (literally five islands) and this is the largest (Yai – big or large). The English names comes from the two huge open caves which make up the main part of this site. You’ll begin this dive on the sloping island wall up current from the caves and spend a bit of time on the hard corals here before going onto the rock plateau in front of the caves at about 14 meters. There area couple of swim throughs here just in front of the caves. Of the two large caves the eastern one is the deepest going about 15 meters in, at the back of this cave is the entrance to a narrow cave system – this should be left to properly trained and equipped cave divers! The western of the cave is much smaller only going around 4 meters into the island, however both caves are about 10 meters wide and reaching up to the surface at low tide. There is a hole at about five meters joining the two caves. To the west of these caves is a third cave with a much lower roof and a soft sandy floor which is easily stirred up. This is the most northern of this group of islands, hence the Thai name. The chimney is the prime focus of this dive, it goes from a cleft in the base of the island at 14 meters almost vertically up to 5 meters where it opens as a hole in the hard coral reef, the chimney branches at 8 meters and leads into a cave with two other openings to the see. Before you come to the chimney you’ll spend some time on the sloping hard coral reef which is covered in anemones – most with clown fish (these have been placed here as part of a university project). In front of the chimney entrance is a large rock with a swim through. On the sand south of this rock is a lush soft coral garden, some of these corals are over a meter tall.